The Giacomazzi Dairy water tower. Giacomazzi, a founding member of UC’s Conservation Agriculture Systems Innovation (CASI) Center, for years has evaluated equipment, planting configurations and fertilization approaches in silage production. He worked closely with other dairy operators to build a reservoir of knowledge and experience that is accelerating the development and implementation of conservation tillage practices, said Jeff Mitchell, UC Cooperative Extension specialist in the Department of Plant Sciences at UC Davis and chair of CASI. In the spring of 2005, Giacomazzi initiated a demonstration evaluation of strip-till corn planting in a 28-acre field as part of an Environmental Quality Incentives Program contract he had received from the USDA Natural Resources Conservation Service. In 2006, he hosted a public field day to share what he learned about strip-till implements, planters and configurations, an event Mitchell considers the best public field day of his Extension career. Giacomazzi has traveled to Davis to address agriculture students, accepted speaking engagements -such as the keynote address at the launch of CASI last year - and hosted numerous agricultural tours on his farm. Dino Giacomazzi, left, and Jeff Mitchell. During the celebration, Giacomazzi took to the podium to turn the spotlight on Mitchell. Giacomazzi praised Mitchell’s personal commitment to sharing conservation agriculture practices. Recognizing Mitchell's distinct character and energy, Giacomazzi said he could think of no more fitting way to honor him than with a customized "Jeff Mitchell Award," which he said Mitchell would hold "in perpetuity." Mitchell travels in the Valley extensively, visits farms from Kern County to as far north as the Intermountain area on the border with Oregon, and takes two or three trips from his Fresno County headquarters to Davis each week for meetings, teaching classes and working with graduate students. “His Toyota Prius has nearly half a million miles on it,” Harben said. During his presentation at the celebration, Mitchell also called attention to the Giacomazzi Dairy’s weathered water tower. The Sand County Foundation, its major partners, California Farm Bureau Federation and Sustainable Conservation, and its other sponsors, S. J. Bechtel, Jr. Foundation, The Nature Conservancy and Farm Credit, are accepting nominations for the 2013 Leopold Conservation Award until July 12. Nominations of agriculturalists and foresters may be submitted at the Leopold Conservation Award website, http://www.leopoldconservationaward.org. Giacomazzi demonstrates strip-tillage at the Leopold Conservation Award celebration. Hanford dairy farmer Dino Giacomazzi, a founding member of UC Conservation Agriculture Systems Innovation (CASI), received the prestigious 2012 Leopold Conservation Award for California in acknowledgement of his exemplary land stewardship and management. The $10,000 Leopold Conservation Award is named in honor of world-renowned conservationist Aldo Leopold. The award, presented annually in eight states, recognizes farming and ranching families who are actively committed to living a land ethic. Giacomazzi manages the dairy and forage production operations at Giacomazzi Dairy, established in southeastern Hanford in 1939. He lives on the 300-acre dairy property and oversees milking, animal nutrition and feed production. In the spring of 2005, Giacomazzi initiated a demonstration evaluation of strip-till corn planting in a 28-acre field as part of an Environmental Quality Incentives Program contract he had received from the USDA Natural Resources Conservation Service. “Dino virtually guaranteed his ultimate success with conservation agriculture by the sheer intensity of this effort and the comprehensive nature of his attention to detail,” said Jeff Mitchell, UC Cooperative Extension specialist in the Department of Plant Science at UC Davis. Mitchell is the chair of CASI. Following this successful trial, Giacomazzi established all of the dairy’s corn acreage using strip-tillage in 2006. However, rather than take a single approach, he set out a comprehensive array of strip-tillage evaluations that included three different strip-till implements, strip-till corn varieties, and twin-row versus single-row planting configurations. Later that year, he opened his dairy to the public for a Strip-Till Field Day that attracted more than 150 farmers. “To this day, CASI considers this field day to be the most successful and impacting extension education event that our workgroup has been involved with during the past decade,” Mitchell said. Over the course of the strip-till evaluations at his dairy, Giacomazzi also shared his expertise with a number of visitors, including representatives of Sen. Dianne Feinstein’s office in Washington, D.C., and the USDA NRCS Regional Agronomist for the Western U.S. In his quest for the optimal CT forage corn system, Giacomazzi investigated twin-row planting options and is now one of the state’s primary authorities on twin-row production. The idea is to stagger two lines of plants 7.5 inches apart in 30-inch row spacing, giving plants optimal access to resources – nutrients, light, water, etc. From 2007 to 2009, Giacomazzi rigorously tested this hypothesis in a series of comprehensive on-farm studies. Since the fall of 2008, Giacomazzi has also been collaborating with scientists from the USDA Agricultural Research Service National Soil Tilth Lab in Ames, Iowa, on a major, large-scale quantification of particulate matter emissions under traditional and conservation tillage at his dairy. He worked with Jerry Hatfield, the research director of the Tilth Lab, and a large group from Utah State University. This group quantified dust emissions using LIDAR, laser beam and dispersion modeling technologies and has found significant reductions in particulate emissions in Giacomazzi’s strip-till system relative to his former standard tillage approach. Last spring, Giacomazzi began using a twin row Monosem planter on his farm that enables GPS precision guidance and application technologies from Trimble Corporation. This instrumentation allows for precision application of seed and nutrients in the same planting pass. He recently showcased his progress on his CT silage production systems by opening his farm to still another public field day that attracted several farmers and media coverage. Hanford dairy farmer Dino Giacomazzi was recognized today for his innovations in conservation tillage at the U.S. Environmental Protection Agency’s 12th annual Environmental Awards Ceremony held in downtown Los Angeles, according to an EPA news release. Giacomazzi was in good company. The 12 businesses and individuals honored included Governor Arnold Schwarzenegger, Fresno mayor Ashley Swearengin and a 14-year-old boy who recorded a song about global warming that reached children on five continents. 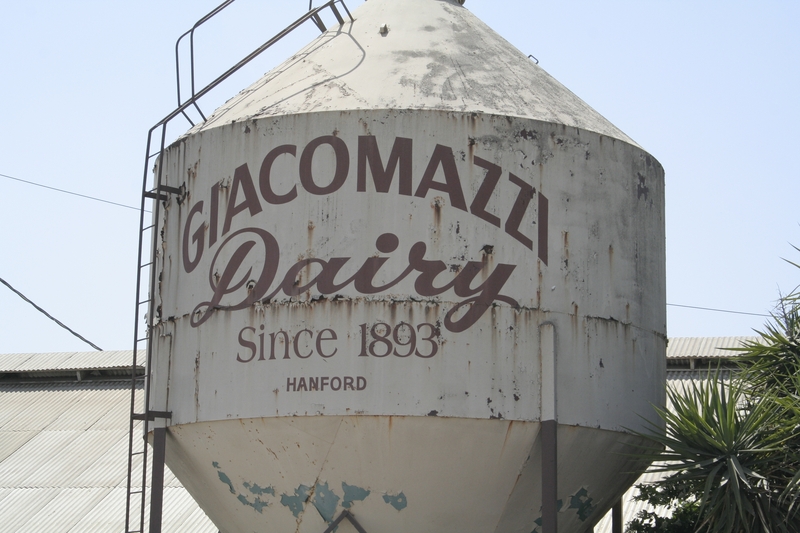 According to the release, Giacomazzi is the fourth generation to manage Giacomazzi Dairy, a family farm of 900 cows and 600 acres, which has operated at the same location in Hanford, Calif., since 1893. Giacomazzi approaches his farm as a holistic system, and is continually looking for cultural practices that are sustainable both environmentally and economically. Working with USDA-NRCS and the University of California, Giacomazzi initiated the first demonstration evaluation of a strip-tillage corn planting system in the Central San Joaquin Valley, and has been experimenting since with different implements, plant varieties and planting configurations to optimize that system. Strip-tillage is a farming practice that involves tilling in narrow strips rather than disturbing soil in the entire field. This process radically reduces diesel, dust, and particulate emissions as well as fuel and labor costs. For his corn-wheat rotation, Giacomazzi has reduced the annual number of tillage passes for each of his fields from 14 to 2. Giacomazzi has hosted several demonstrations and field days which have led to strip-till adoption in more than 25,000 acres in California, and has participated in numerous studies that will provide a better understanding of the relationship between dairy operations and air and water quality. 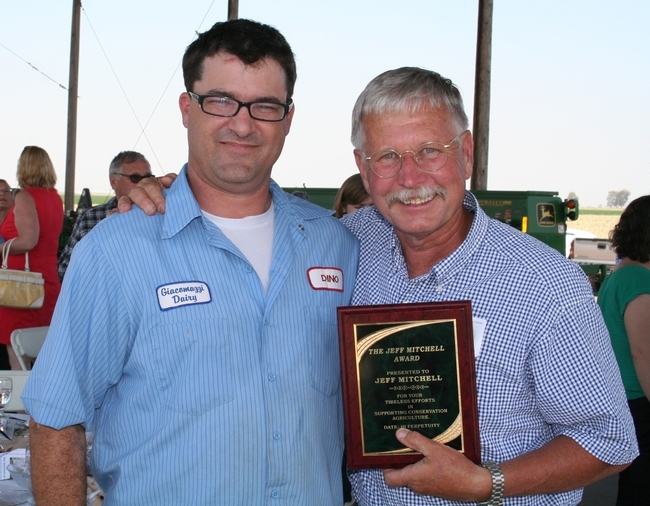 Giacomazzi was presented the Conservation Tillage Farmer Innovator Award for 2008 by the University of California and the U.S. Natural Resources Conservation Service Conservation Tillage Workgroup. The EPA awards were presented on the agency’s 40th anniversary to help celebrate "40 Years of Environmentalism," the news release said. 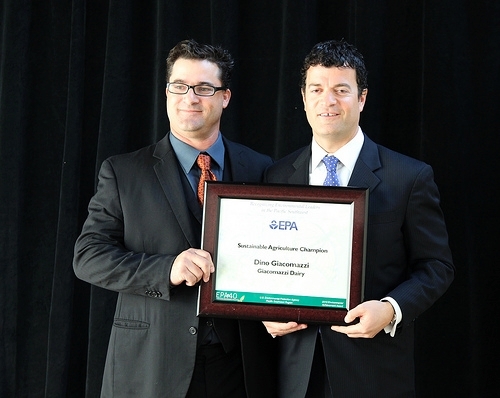 Giacomazzi, right, receives EPA award from Jarod Blumenfeld, administrator of EPA Region 9. Leading San Joaquin Valley conservation tillage farmers Scott Schmidt of Five Points and Dino Giacomazzi of Hanford recently hosted a group of 38 no-till farmers from Western and South Australia. The visit was part of a five-week excursion the Australians were conducting through conservation agriculture regions of the US and Canada. 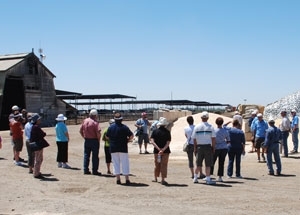 The Valley tour was jointly coordinated by California’s Conservation Tillage Workgroup, a diverse group of over 1,500 farmer, private sector, public agency and University members, and Crabtree Ag Consulting’s “No-till” Bill Crabtree of Beckenham, Western Australia. Crabtree, a renowned and award-winning no-till pioneer and promoter whose efforts have contributed substantially to the adoption of no-till farming on over 90 percent of the wheat acreage in Western Australia, and California CT workgroup chair Jeff Mitchell of UC Davis met in 2006 at an international conference on no-till adoption in New South Wales, Australia. Crabtree made a presentation at one of the California workgroup’s farmer meetings in 2007 in Five Points. The two no-till researchers have remained in contact since 2006 and worked together in organizing this summer’s conservation farming SJV visits. 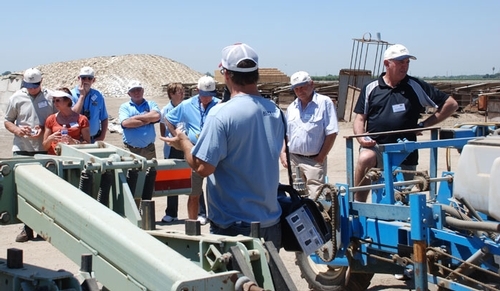 This year’s Australian tour group made a stop in the San Joaquin Valley to learn about the progress farmers and researchers have recently made with conservation tillage cropping systems. The group was on their way from visits in Southern California to more traditional no-till regions in the Dakotas and Canada. Their first farm visit was with Scott Schmidt, manager of Farming ‘D’ in Five Points. The diverse crop mix produced by this farm - which includes processing and fresh market tomatoes, wheat, cotton, onions, garlic, alfalfa and lettuce - contrasted sharply with the monoculture wheat fields common throughout Western and South Australia where average annual rainfall ranges from 200 to 400 mm (8 to 16 inches) and occurs primarily during the winter (similar to the SJV). Within the diverse crop rotations that are pursued at Farming ‘D,’ Schmidt has developed a number of minimum tillage techniques and implements. He now contemplates converting segments of these rotations to even more ambitious conservation tillage management in the future. Schmidt is also a local pioneer in the use of overhead, mechanized center pivot irrigation. The flexibility afforded by irrigating with center pivots makes the conversion to more advanced CT systems more feasible. The tillage typically required to establish beds and furrows for surface irrigation may no longer be needed under center pivot irrigation. Following their visit with Schmidt, the Aussie no-tillers crossed the Valley and were hosted by Dino Giacomazzi and three generations of his family at their dairy in Hanford. Over the past five years, Giacomazzi has developed and refined strip-tillage corn and no-till winter wheat and triticale planting techniques. He proudly and methodically walked his visitors through his entire silage production process. 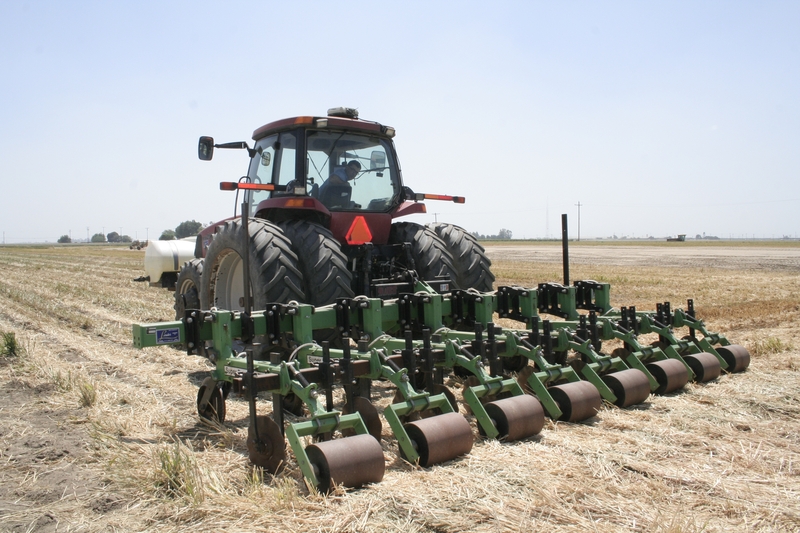 While the production contexts and details vary widely between Western and South Australia and the San Joaquin Valley, in many ways the fundamental drive toward developing conservation tillage systems that farmers in both regions exemplify are universal. Cutting production costs by reducing tillage passes results first in cheaper production and, as long as yields can be maintained or improved, more profitable production systems. For Giacomazzi, those environmental benefits have included fewer emissions into the air, more residue on the soil surface, and more organic matter in the soil. 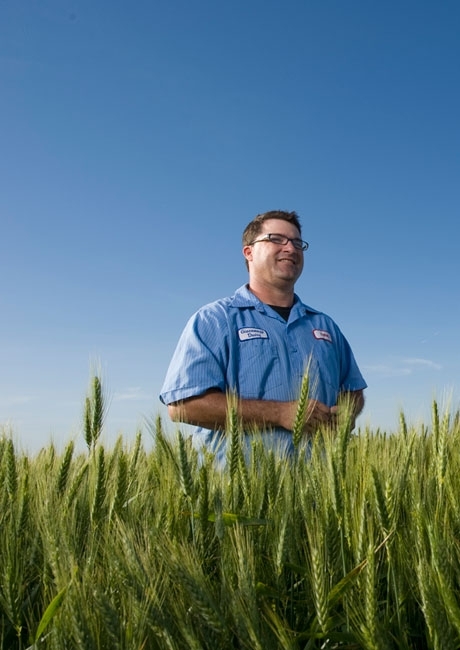 For the Australian no-tillers, it has meant combatting soil erosion which was causing lower yields and higher production costs. It had become nothing short of a national plague 20 ago in Western Australia’s light textured soils that are very susceptible to wind erosion. More information on local conservation tillage is available at the CT Workgroup’s website: http://groups.ucanr.org/ucct/ and in the book by No-till Bill Crabtree, Search for Sustainability with No-till Bill in dryland agriculture. Giacomazzi (with back to camera) speaks to Australian visitors.